Multi-vitamins are still the most popular type of supplements, with nearly half of all adults (46%) taking them daily or occasionally (2016 Mintel research). Experts may tell us that a well-balanced diet is the best way to ensure we get the nutrients we need, but a great many women in particular are turning to multi-vitamins to make up any shortfall. Add to that, the fact that a lot of our food is increasingly processed and nutrient-light, and it’s no wonder they want to take extra steps to care for themselves. The good news is that many multi-vitamin manufacturers take the situation seriously, and none more so that our recommendation for Best Women’s Multi-Vitamin to Buy in the UK in 2018, Performance Lab® Whole-Food Multi Women’s Formula. 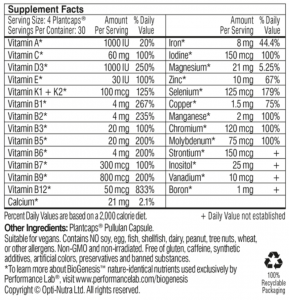 Why Buy a Women’s Multi-Vitamin Formula? Antioxidants, such as vitamins A, C and E.
There are dozens of multi-vitamins on the market, all claiming to do various different things. It’s worth doing your homework to make sure you’re choosing the right one for you. The first thing we would warn against here at Supplement Reviews UK is buying a generic multi-vitamin. Instead, you want a formula that specialises in key women’s vitamins and minerals in ratios that make it effective. Women have different dietary and nutrition needs than men. You therefore want a multi-vitamin which recognises and caters for specific areas of women’s nutritional needs, such as one that contains the female-friendly vitamins A, B, C, D, E K, as close to their daily value as possible. Performance Lab® Whole-Food Multi Women’s Formula offers exactly that, as well as some important minerals valuable to women in particular, such as magnesium, iron, and iodine. Antioxidants can help to fight free radical damage in the body, considered the cause of many diseases as well as ageing. Vitamin A aids skin, soft tissue and eyesight, while vitamin C boosts immunity to colds, helps to fight infections and heal wounds. It also protects skin and vision from UV damage. Vitamin E is needed to keep cells healthy and may slow down signs of ageing. Be aware, however, that too much of it raises your risk of bleeding, which is why it is capped at 100% Daily Value and no more in Performance Lab® Whole-Food Multi for Women. The B vitamins are very important for a woman’s body, especially B6, B9 (folic acid) and B12. They help to prevent fatigue, boost cognition and help with energy. Older women in particular, as well as people who cut out meat from their diet, are at risk of B vitamin deficiency. Folate (folic acid), of course, is needed to build normal red blood cells in adults and is extremely important for pregnant women or women of child-bearing age who may be trying to get pregnant. It helps the development of a healthy brain and spinal cord in the foetus, helping to prevent conditions such as spina bifida. Performance Lab® Whole-Food Multi Women’s Formula includes 200% of the Daily Value of B9. 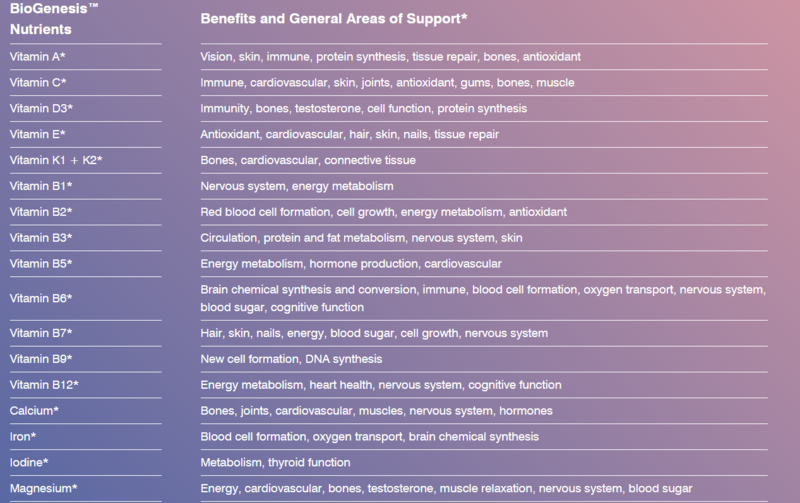 As you can see from the Supplement Facts, all of the B vitamins included in Performance Lab® Whole-Food Multi for Women exceed 100% of the recommended Daily Value. Vitamin D helps to move calcium and phosphorus around the bloodstream, preventing the body from taking it from the bones, risking conditions such as osteoporosis. According to research, one in five adults in UK have low vitamin D levels, which is why the NHS recommends Vitamin D supplementation. Performance Lab® Whole-Food Multi for Women includes 250% of your Daily Value of Vitamin D.
Vitamin K helps to keep bones strong and helps blood to clot in older people. It may also help to prevent heart disease, which kills more than twice as many women as breast cancer each year. Performance Lab® Whole-Food Multi, Women’s Formula, contains 125% of the Daily Value of vitamins K1 and K2. Performance Lab® Whole-Food Multi for Women includes 100% Daily Value of iodine, also important to protect the brain of a growing foetus, another significant benefit for pregnant women. We would, of course, recommend you take advice on vitamins from your doctor when you’re pregnant. Iodine is also critical for hormone balance, thyroid health and breast health. A lack of it can potentially damage your heart, liver, kidney and more. The World Health Organization warns that iodine deficiency is a health threat for two billion people around the world. Would you believe that nearly one third of the world’s population is anaemic, and lacking in iron? Menstruating women in particular need iron, since the body’s need for the mineral (which is needed to make haemoglobin) increases during blood loss. Performance Lab® Whole-Food Multi, Women’s Formula provides 44.4% of your Daily Value, a very good first step to making sure you gain enough in your diet. 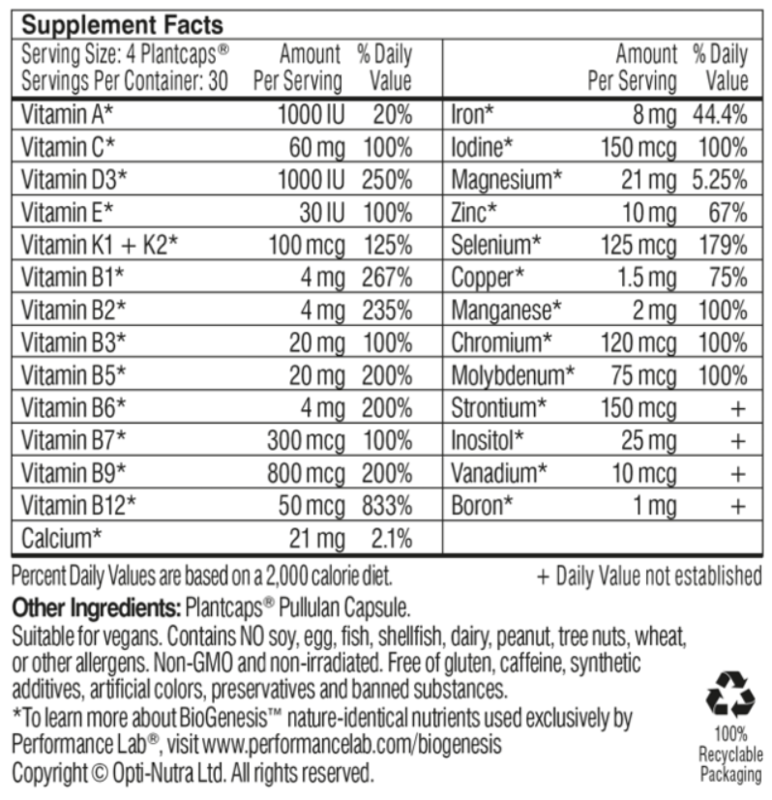 Note that many generic multi-vitamins lack the iron that women need because it’s not advised in men over 50. Many older women in particular are thought to be deficient in magnesium, which gets harder to absorb as we age. It is an important nutrient in younger women too, responsible for more than 300 biochemical tasks in the body. Signs of magnesium deficiency include leg cramps, insomnia, headaches and constipation. Women over 50 have special vitamin and mineral needs, requiring extra calcium, vitamin D and B vitamins in particular, to prevent bone loss or osteoporosis, heart issues, problems with cognition and diabetes. The good news is that the latter (vitamins D and B) are included in generous dosages in Performance Lab® Whole-Food Multi, Women’s Formula. Most experts agree the calcium is best gained from food alone or, if not possible, a standalone calcium supplement. The female-friendly ingredients in Performance Lab® Whole-Food Multi for Women aren’t its only ace in the hole. It provides added bioavailability – namely, the ease in which the body can absorb the vitamins – by mimicking the vitamin versions found in nature. In a market where many manufacturers use synthetic versions of their vitamins and minerals, usually not as well absorbed by the body, Performance Lab® Whole-Food Multi, Women’s Formula, uses a revolutionary and exclusive process called BioGenesis™. What does that mean? Performance Lab® grows its nutrients on yeast, plant and probiotic cultures in a lab to replicate their exact state in nature. It means nutrients come with natural probiotics, fibre, antioxidants, cofactors and enzymes, and are identical to the versions found in nature. All of which makes it easier for the body to absorb, making them much more effective than other synthetic nutrients provided by many competitors. It also means that Performance Lab® Whole-Food Multi, Women’s Formula, can use smaller dosages of its ingredients to gain the same effect. This is particularly important because it helps to avoid the mega dosages of vitamins that can sometimes cause health concerns. If we sound like fans of the process, hands up: we are. It’s a demonstration, if one is needed, that Performance Lab® is truly committed to providing the very best product that it can. As a company, Performance Lab® also ensures its supplements are eco-friendly, cleaner and safer than conventional vitamins. 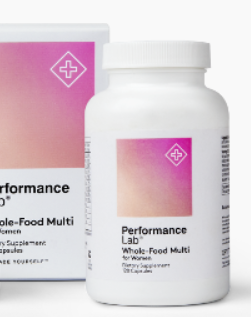 Performance Lab® Whole-Food Multi for Women, for instance, is additive-free, GMO-free, and includes probiotic nutrients and Plantcaps® which aid digestion. As a result of all the above, Performance Lab ® Whole-Food Multi Women’s Formula is safe for daily use in the longer-term. The manufacturers recommend Performance Lab ® Whole-Food Multi for Women as a foundation for overall health, pointing out that it can be safely taken alongside their other formulas, such as Energy, Sleep, Vision, Mind and more. We’re not hiding the fact that we’re big fans of Performance Lab® Whole-Food Multi Women’s Formula. We hold our hands up and say we wholeheartedly believe it is THE best multi-vitamin for women in the UK. It offers gender-specific support, with more than 100% of the Daily Value of 17 essential vitamins and minerals, providing support for the immune system, heart health, female hormones, bones and joints, nervous system, hair, skin, metabolism and more. 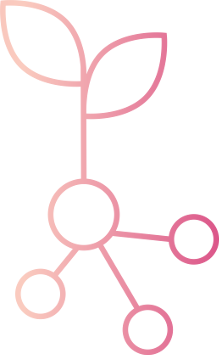 Its patented BioGenesis™ process really is a game-changer too. Performance Lab® has hit on a way to create vitamins and minerals that genuinely mimic those found in nature, increasing bioavailability significantly. On top of that, you get one of the cleanest and natural multi-vitamin supplements around. Performance Lab® recommends that customers think of Whole-Food Multi as a starting point, a foundational support for overall health. It then suggests that the multivitamin can be taken alongside other function-led Performance Lab® formulas, such as Mind, Energy, Sleep, Vision, T-Booster, Sport and more.